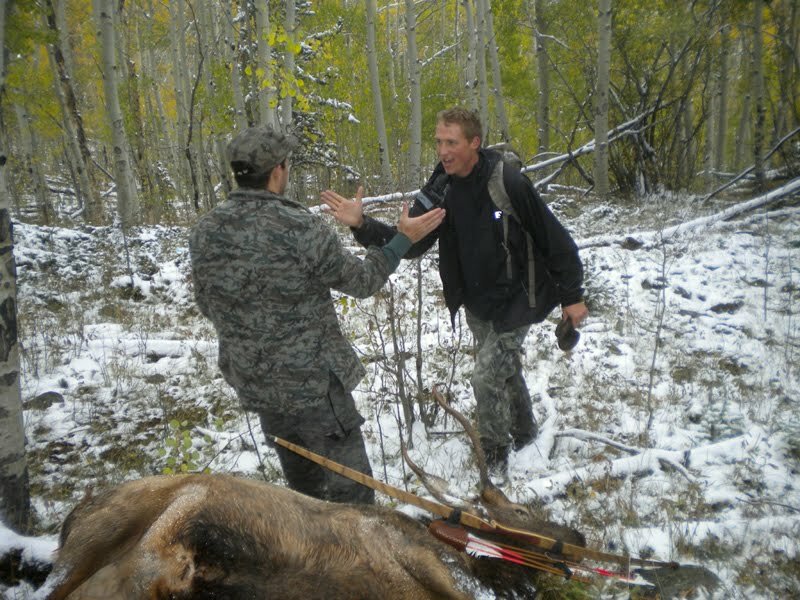 Danny, my brother, and Del, a good friend, are two of the elk killinest guys that I know. 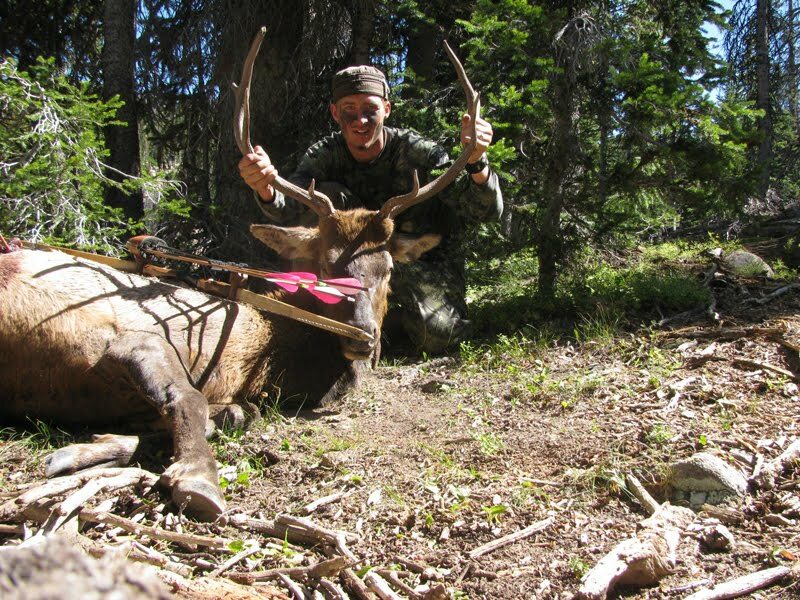 Each has killed 4 bull elk in the past 5 seasons. 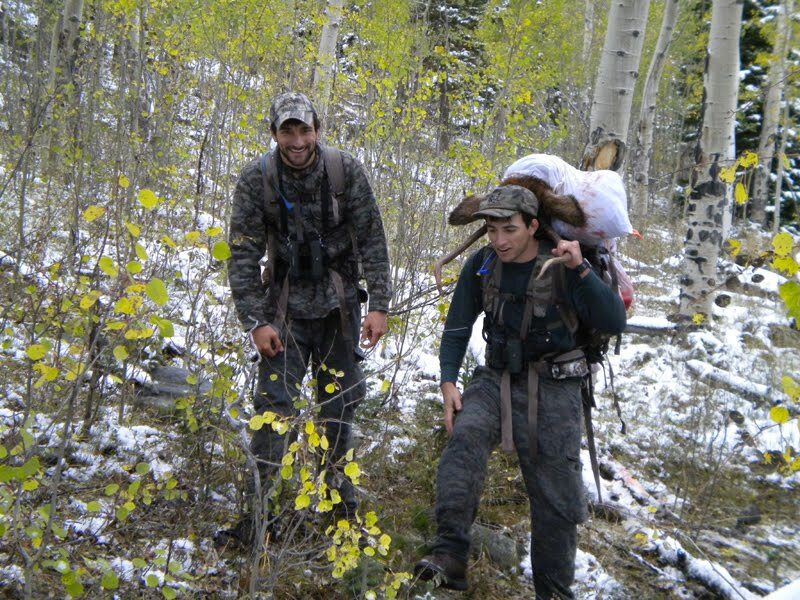 They are part of the 20% in the saying, "20% of the guys kill 80% of the elk". We met Del early in 2009 and immediately became good friends. The shared love of elk has a way of creating friendships. 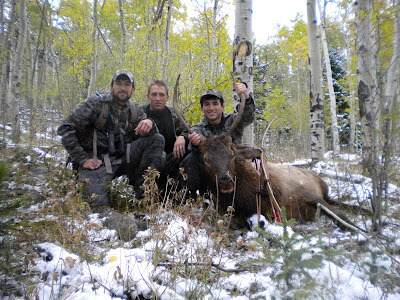 From the time we met until the opening weekend of elk season, the three of us hit the range several times a week. We started at 7am and were usually the only ones on the range. 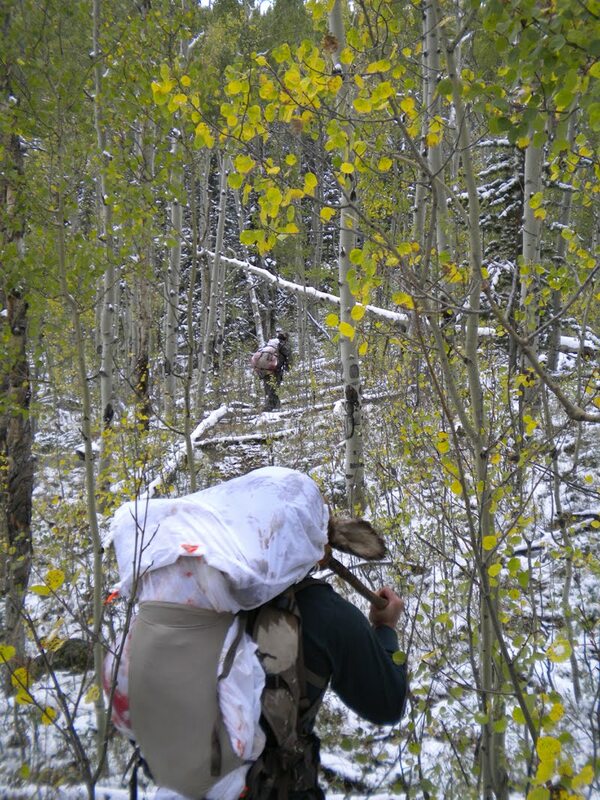 We loosed thousands of arrows together - Danny shooting a recurve, and Del and I shooting longbows. We really grew as archers, but not as fast as we grew as friends. Danny, who has always been a good shot, had a shoulder surgery which forced him to become a left handed archer for the time being. In the 5 months as a lefty he caught up to me on the score card (which really irks me, and Danny wallows in the satisfaction of knowing that too). 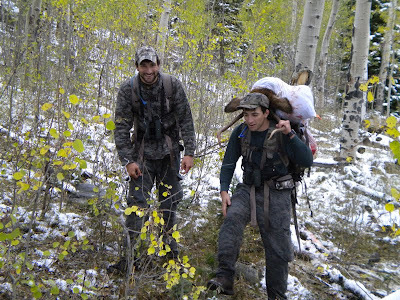 By the end of the summer we were all shooting better than ever and feeling pretty cocky about the upcoming season. 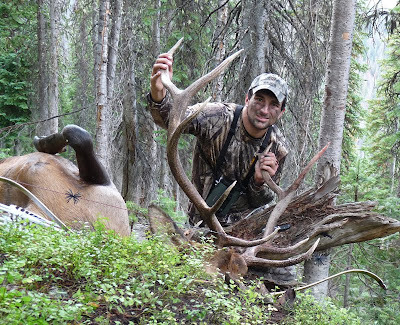 Two weeks in to the season Danny and Del continued on their elk killing ways. Each taking one shot, each shot resulting in a dead bull elk (this year they both got their smallest bulls ever). 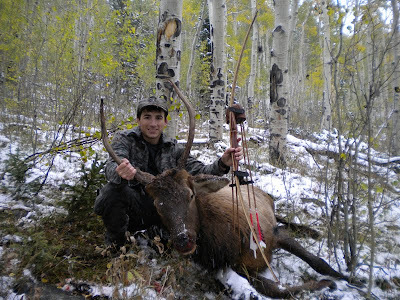 Danny used a Rampart recurve with a Grizzly broadhead, 600 grain CX Rebel Hunter arrow with 200 grains up front. He obtained a complete passthrough on a double lung shot. Danny followed a 200 yard heavy blood trail. 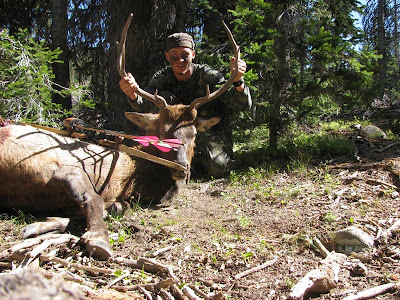 Del used a Rampart longbow with a Snuffer broadhead, 620 grain CX Heritage arrow with 200 grains up front. Del took a quartering away shot, received about 20 inches of penetration, and had a 300 yard sparse blood trail. Me? Well...I was biding my time (right). The final evening of my 2009 hunt the three of us finally got to elk hunt together for the first time. Del, who plays the bugle like a magical flute, and Danny were calling behind me as I slowly moved towards a large herd of elk. I will admit that I flat out missed a cow earlier that evening. I was mad at myself and embarrassed that that would happen in front of my new hunting buddy. But I didn't have too much time to be mad. A spike was making his way right to me. I tried to clear my mind of the earlier miss as I drew my bow on this spike, who was quartered away at a steep angle. The snow was coming down and my hands were freezing. It was hard to let go of the bowstring. I stared at the point on his side which would bring my arrow to the far front shoulder. I was telling my fingers to let go but they were so cold and stiff that it was hard to do. The shot was a little further back than I was wanted, but not by much. The arrow was steeply angling towards the front shoulder, it was still a good shot. The spike hauled the mail when I shot but none of the other elk around seemed to care. With the shot placement where it was we all agreed that I probably got one lung, and that it would be wise to allow the elk time. We decided that instead of blowing all the elk out, who might take the spike with them, we would come back and look in the morning. We didn't spend much time looking. 200 yards from where I shot we found him. 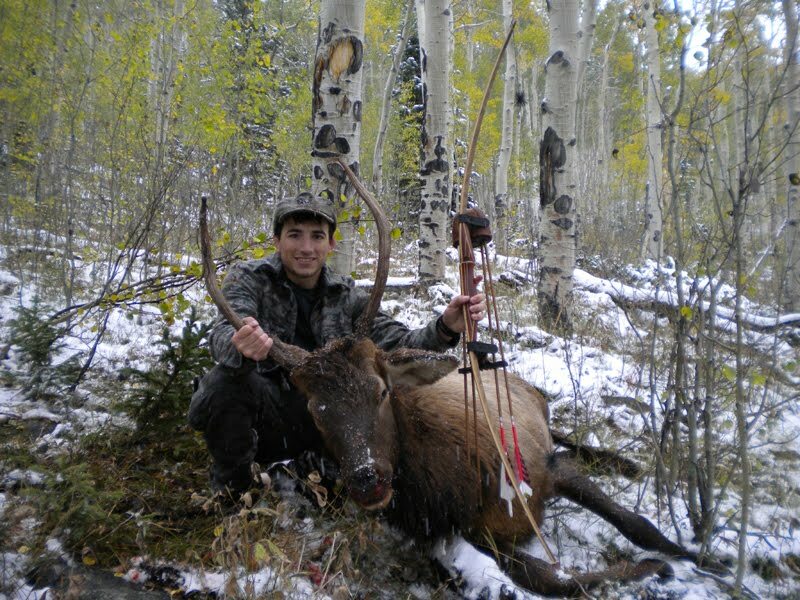 I used a Mohawk longbow, Grizzly broadhead, 550 grain arrow with 200 grains up front. The pack out was short and sweet. We talked and joked on the way out and had a good time. It meant a lot to me that Del came back the next morning to help look for the elk and pack him out. The practice really paid off this season. The three of us all felt a great deal of satisfaction knowing that we put in the time before the season and that it served us well. 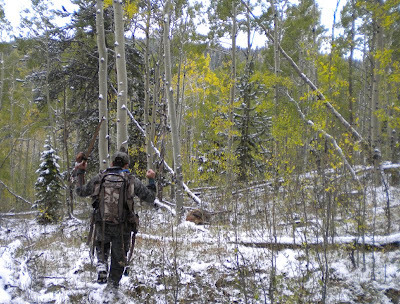 We have started hitting the range again, and probably will several times a week until the next elk season. 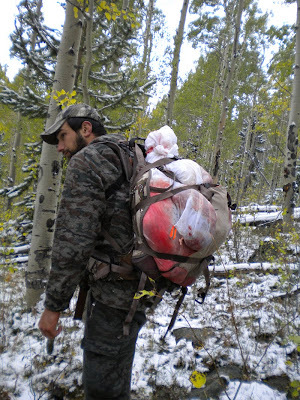 On another note, I used some new game bags this year from Caribou Gear. They pack very small, are ultra light, and kept 100% of the bugs off. We will have them listed on our website in the near future. In the meantime check out their website: http://www.biggamebags.com/ . I have not seen another game bag out there that has it all, light, small, 100% bug free, and still be as tough as these bags were.